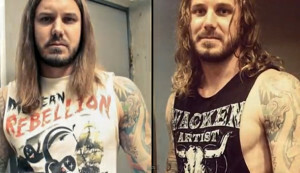 Tim Lambesis, the frontman for the Christian heavy metal band As I Lay Dying, was sentenced Friday to six years in state prison for paying an undercover agent, who was posing as a hitman, to kill the singer’s estranged wife. Lambesis, 33, pleaded guilty in February to a felony murder solicitation charge and had faced up to nine years behind bars. Deputy District Attorney Claudia Grasso said Lambesis met with the undercover agent at an Oceanside bookstore in May 2013 and supplied $1,000, gate codes, photos of his wife and dates when he would have his children and wouldn’t be considered a suspect in her murder. “(He) basically told the undercover agent that his wife was making things very difficult for him and he wanted her gone,” the prosecutor said outside court. When the undercover agent — who went by the name “Red” — asked Lambesis if he wanted his wife dead, the defendant replied, “Yes, that’s exactly what I want,” according to Grasso. Grasso said the undercover agent told Lambesis that the “hit” would cost $20,000, and the defendant agreed. After their meeting, Lambesis told the undercover agent, “Just to clarify, I do want her dead,” the agent testified last September. According to court testimony, Lambesis told at least two people at a Carlsbad gym that his relationship with his wife, Meggan, had deteriorated and that he wanted to get rid of her. Lambesis initially approached a personal trainer at the gym about his problem with his wife. The defendant told the trainer that his wife was controlling visitations for their three adopted children and was spending money on attorneys for their impending divorce. The trainer subsequently contacted law enforcement and the meeting with “Red” was arranged. Lambesis was arrested on May 7, 2013. Defense attorney Thomas Warwick said Lambesis had gotten into bodybuilding and eating healthy, and at some point began taking steroids, which affected his thought process.